Ever wonder what separates a decent acoustic guitar from a great one? One of the most important factors is the way the guitar neck joins the body. The neck joint sets the foundation of the playing experience, and will directly impact a guitar’s feel and sound for the rest of its life. Let’s break it down. One of the fundamental challenges of crafting an acoustic guitar that will perform well is in reconciling two competing goals: structural strength vs. sound. Because of the amount of string tension exerted on a guitar (particularly a steel-string acoustic model), it needs to be structurally strong enough to resist folding in on itself from the forces of that tension, which essentially want to pull the peghead and bridge toward each other. At the same time, a guitar’s tone-producing capability comes from the use of light, responsive tonewoods and bracing, so the wood needs to be able to resonate to produce a pleasing acoustic sound. If a guitar is overbuilt with excessive structure, it will suffer tonally because the movement of the materials will be restricted. If a guitar is built too lightly, the forces of tension will pull the guitar out of alignment. For this reason, the ability to control a guitar’s neck-to-body geometry is a critical part of maintaining an optimal balance between stability and sound quality. This is why the neck joint design is so important. A well-designed guitar neck joint and a proper neck angle setup will occupy a sweet spot in which the guitar is both structurally balanced while also playing and sounding great. This helps the guitar stay in tune, makes it comfortable for a player to fret the strings, and enhances the overall tone and sustain, all while keeping the guitar from getting too physically stressed from the string tension. It’s like having strong core muscles. It means more stability, better posture (a good neck angle), and less likelihood of getting thrown out of whack. And like a strong core, it supports better all-around performance. 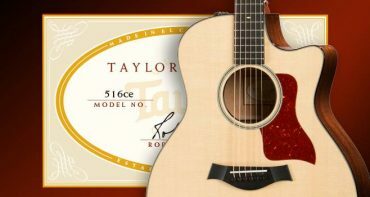 As Taylor Guitars co-founder Bob Taylor likes to say, Taylor has the equivalent of a Ph.D. in guitar neck design. 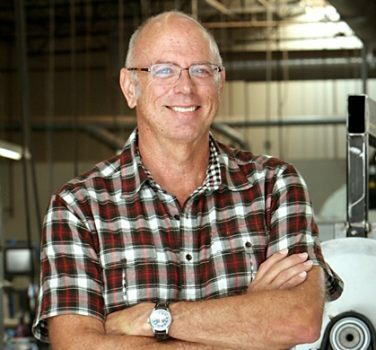 It started with Bob’s obsessive pursuits as a young guitar maker, with the goal of making consistently great-playing guitars that could also be easily adjusted over time. 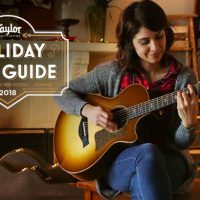 It culminated years later with Taylor’s patented neck design, which proved to be a game changer, cracking the code on an age-old problem with the way an acoustic guitar’s neck and body are traditionally secured and serviced throughout its life. 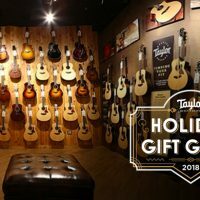 Well over a million Taylor guitars have been crafted with the patented Taylor guitar neck since the design was born in 1999, and the proof is in the playing. 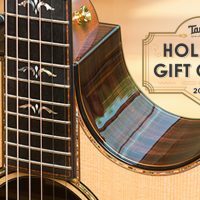 That’s a big reason why the Taylor guitar neck has become widely recognized as the gold standard for playability in the acoustic guitar world. These days, if you go to a music store and play different brands of guitars, you’ll probably find varying degrees of playability and intonation. 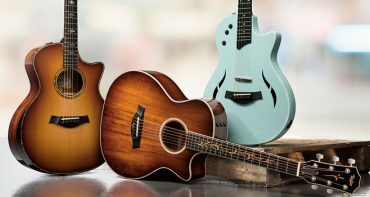 Among reputable brands, many new guitars will probably play pretty well initially, but the important question is how they’ll fare over time. 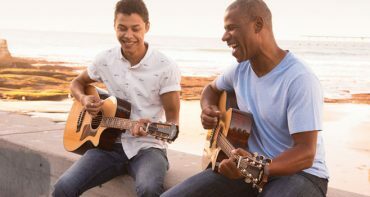 What many customers often don’t realize when they buy a new acoustic guitar is that the ability to make micro-adjustments to the guitar’s setup (to maintain the proper guitar neck angle) is essential for the guitar to have a long and healthy life. Why? Because every steel-string acoustic guitar made of wood will physically change over time. This isn’t a design flaw; it’s simply the nature of the way wood ages, how the materials respond to the forces of tension being exerted upon them as a guitar, how the wood reacts to surrounding climate conditions, and how the guitar naturally wears as it’s played. The ability to recalibrate the neck angle from time to time is as natural as getting a tune-up for a car. That’s one of the key advantages of Taylor’s guitar neck design: the ability to make precise angle adjustments easily over the entire life of the guitar without ever compromising its structural integrity. 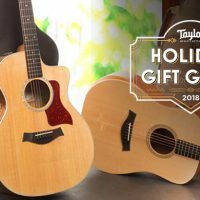 This makes a Taylor guitar a great investment — both in the guitar itself and in your own musical enjoyment — since you’ll be able to enjoy the guitar to the fullest as long as you own the guitar. Traditional methods of attaching an acoustic guitar neck to a body, such as a dovetail or mortise-and-tenon joint, involve gluing the neck in place. And once the neck is set, it’s difficult to reset it, so if the neck angle isn’t correct the first time, more stress will be exerted on the neck, making it structurally compromised right out of the gate, with more issues likely over time. Guitar service technicians can attest to the “major surgery” required to make even minor adjustments to guitars with a traditional neck, which can take a long time, translate into substantial cost to the customer, and leave the guitar structurally compromised due to the need to remove wood material from the guitar’s heel and alter the bridge. 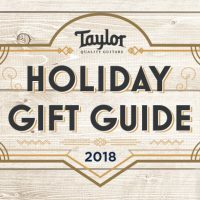 One of the critical aspects of Taylor’s neck joint design is that both the neck and the body of each guitar must be made with extreme consistency in order for the design to work. That’s where the precision and consistency of Taylor’s proprietary tooling and manufacturing processes shine. As a result of our sophisticated production approach, Taylor’s craftspeople can easily set the perfect neck angle for every guitar made at the factory. It also makes the guitar equally easy to service, so a qualified service technician can perform a Taylor neck reset in about 10 minutes, without any “major surgery” that could compromise the guitar’s performance. Read on for a breakdown of the key design elements that set the Taylor neck apart from others. On traditional acoustic guitar necks, the neck itself ends at the heel, leaving the fretboard extension unsupported. Typically the fretboard extension would be glued to the top of the guitar to secure it. But as the guitar changes over time, the top may sink or swell, changing the neck angle in the process. The fretboard extension moves with the top, so it can create a hump where the angle changes. 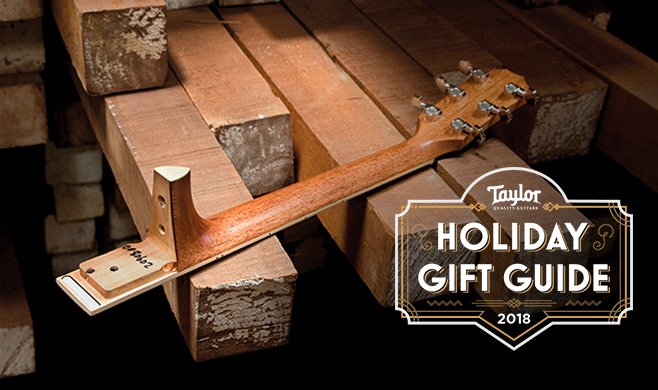 With the Taylor neck, the paddle portion will be precision-fitted into a pocket that’s routed in the guitar body with a computer-numerical control (CNC) mill. Pockets are precision-routed into a neck block of the guitar body using a CNC mill. The neck will later be inset into the pockets and bolted securely in place. Laser-cut and milled in varying increments of .002 inch, these form the basis of setting the perfect neck angle. The spacers are inset (without glue) into the two pockets where the neck will meet the body and can be changed easily to micro-calibrate the neck angle in Final Assembly and throughout the guitar’s life. The glueless, three-bolt assembly ensures a secure wood-to-wood surface connection between the neck and body and a strong transfer of sound between the neck and body. The design also makes it easy to remove the neck for service at any time. Like the neck and body, these are CNC-milled for accurate and consistent dimensions. This contributes to our ability to set the precise body geometry on every guitar. This combines structural improvements (see Scarf-Jointed Peghead below) with greater computer-milling capability to make a straighter neck. The ability to add the heel separately enables us to process the neck and fretboard as a flat surface, ultimately bringing greater overall stability to each neck. Part of Taylor’s three-piece neck design, this more than doubles the strength of the guitar neck where the angled headstock meets the neck shaft to give the neck more resilience. On a single-piece neck, this is a structurally vulnerable area. Our three-piece neck design allowed us to change the cutting specifications to increase the yield from each tree harvested. Rather than cutting traditional rectangular 3×4-inch neck blank dimensions, Bob Taylor changed our cutting specifications to 4x4s. This ensures the proper grain orientation every time — the wood can’t be cut wrong because of its square dimensions — and roughly doubled the yield from each tree. 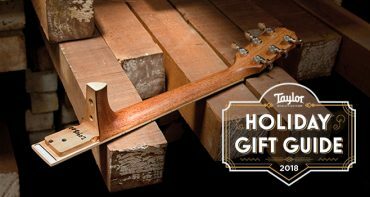 The Taylor Guitar Neck is consistent across the Taylor line from the GS Mini, Academy and 100 Series all the way to the Koa and Presentation Series. 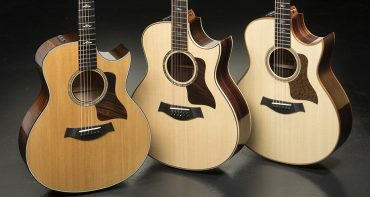 Learn more about the Taylor acoustic guitar line here.